This collection makes a critical and creative intervention into ongoing debates about the relationship between poetry and autobiography. Drawing on recent theories of life writing, the essays in the first part of this volume provide new analyses of works by a range of poets, dating from the early modern period to the present day. 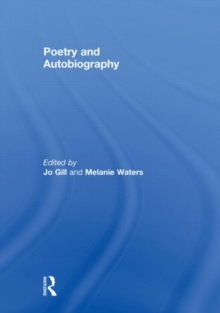 Exploring the autobiographical resonances of poems by Martha Moulsworth, Mina Loy, Anne Sexton, Joe Brainard, Edward Kamau Braithwaite, and Gwyneth Lewis, the authors here examine the extent to which discourses of truth and authenticity have been implicated in traditional interpretations of lyric poetry. In doing so, they endeavour to illuminate the complex intersections - and divergences - of poetry and autobiography, asking what these forms might learn from each other about issues of shared concern, from questions of identity and textuality to those of reference and audience. The creative reflections which form the second part of the collection develop and respond to these questions in various suggestive and original ways; here poetry and prose are used in order to test the relationship between poetry and life writing and to explore issues of memory, time, place, subjectivity and voice. This book was published as a special issue of Life Writing.